Lorraine Hansberry: Sighted Eyes and a Feeling Heart | KERA Learn! Lorraine Hansberry broke down gender and racial barriers when she became the first female African-American playwright to have her work, A Raisin in the Sun, performed on Broadway. Hansberry was also the first African-American playwright and the youngest playwright to win the New York Drama Critics Circle Award for Best American Play. The legacy of her powerful literature still resonates with readers today, but her personal story is far less known. 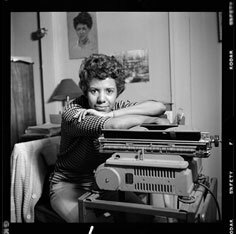 The new American Masters documentary Lorraine Hansberry: Sighted Eyes/Feeling Heart will feature an in-depth presentation of Hansberry’s complex yet fascinating life. The documentary portrays the writer’s lifetime dedication to fighting injustice and how she found her way to using art as her platform for activism during a crucial time for black civil rights. The film also features personal memories of Hansberry from family, friends and colleagues. McCormick believes Hansberry’s work gave readers an idea of how to achieve the American dream even when it is being denied. The premiere of this film came a week after the start of KERA’s own Race In America Film Series. KERA will present two more film screenings and conversation events in coming weeks to facilitate a deeper understanding of American minority experiences. The American Masters documentary, Lorraine Hansberry: Sighted Eyes/Feeling Heart is available to stream via American Masters and Passport. Are you a teacher, homeschool parent or other educator? © 2019, North Texas Public Broadcasting, Inc.